Diastasis recti, is the separation of normally joined abdominal muscles-- frequently as a result of pregnancy. Diastasis occurs with approximately 1/3 of women who have had a baby. This is frequently what technically leads to lower back pain during pregnancy. (As your belly gets bigger, the abdominal muscles separate and your lower back no longer has its muscular support.) It is not necessarily painful, and does not usually require surgery to repair. The abdominal wall is comprised of four main pairs of muscle tissue, each with right and left sides, which cover and support the abdominal cavity. The Rectus Abdominis Nicknamed the "six pack", the rectus abdominis runs vertically from the sternum to the pubic bone. Its primary job is spine flexion, particularly in the supine position. Exercises like crunches flex the upper spine, which move the rib cage closer to pelvis. Pelvic tilts and reverse rolls flex the lower spine, which move the pelvis closer to the rib cage. A narrow band of connective tissue (the linea alba) runs down the body's midline between the rectus abdominis. 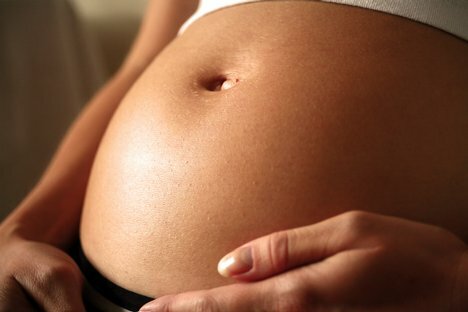 During pregnancy, the linea alba widens and becomes thinner in response to hormones and the force of expanding uterus. stomach muscle separation, (diastasis recti) a fairly common occurrence during the later part of pregnancy and the postpartum period, causes the right and left sides of the rectus abdominis to separate along the linea alba. The External Oblique and Internal Oblique The external oblique is the most exterior layer of the abdominal wall and runs diagonally from the ribs toward the midline. The internal oblique lies underneath the external oblique and has diagonal fibers that run in the opposite direction. Together, they form an X shape across your torso. You can think of the top half of the X as the external oblique and the bottom half of the X as the internal oblique. These two muscles always work together and perform lateral spine flexion (side bends) and assist in spine rotation. The Transverse Abdominis The deepest layer of the abdominal wall, and the most important in postpartum exercise, is the transverse abdominis. It's fibers run across the abdomen and performs abdominal compression, which draws the belly inward, and narrows the waist. Interestingly, unlike most skeletal muscles, the transverse abdominis does not move bone.After pregnancy, contraction of the transverse abdominis acts like an internal splint, helping to close abdominal separation from the inside. It's the body's most important core stabilizer and is responsible for re-flattening the abdominal wall after pregnancy. Diastasis is a common and normal condition in newborns. It is seen most frequently in premature and African American infants. In pregnant women, increased tension on the abdominal wall may lead to diastasis recti. Multiple births or repeated pregnancies increase the risk. Women who are 12 or more weeks pregnant should avoid aggressive abdominal exercises, which may worsen the condition. A diastasis recti abdominis looks like a ridge, which runs down the middle of the belly area. It stretches from the bottom of the breastbone to the belly button, and increases with muscle straining. In infants, the condition is most easily seen when the baby tries to sit up. It may not be seen when the child lies on the back and is relaxed. When the infant is relaxed, you can often feel the edges of the rectus muscles. Diastasis recti is commonly seen in women who have multiple pregnancies, because the muscles have been stretched many times. Extra skin and soft tissue in the front of the abdominal wall may be the only signs of this condition in early pregnancy. In the later part of pregnancy, the top of the pregnant uterus is often seen bulging out of the abdominal wall. An outline of parts of the unborn baby may be seen in some severe cases. The doctor can diagnose this condition by performing a physical exam. Lie on your back with your knees bent. Slowly raise your head and shoulders, reaching toward your knees with outstretched arms. While maintaining this position, place one hand horizontally along the “center seam.” You should feel a softer region between the taut recti muscles on each side. Measure how many fingers fit into the soft gap or bulge. One to two fingers is normal and you may perform curl-ups. If you can fit three or more fingers, you have a diastasis and should perform the modified exercise to strengthen the recti muscles and prevent further separation. Avoid curl-ups and leg-lowering exercises! Postpartum check for diastasis Perform the same check as above. You should wait until three days after delivery to perform the diastasis check, as the muscles will be too slack for a reliable result. If you had a C-section, you should wait approximately six weeks or until your incision has healed. If you do have diastasis recti, you can perform the same corrective exercise as above. No treatment is needed for pregnant women with this condition. In infants, the rectus abdominis muscles continue to grow and the diastasis recti gradually disappears. Surgery may be needed if the baby develops a hernia that becomes trapped in the space between the muscles. Two main concepts must be understood and utilized to quickly, safely, and effectively strengthen and flatten your abdominal wall after pregnancy. First, a critical component for restoring your abs and the development of core strength is learning to control the shape of your abdominal wall during exercise. To do this, you need to train your abs to pull back in toward your spine during exertion. The quickest and safest way to develop a flat abdominal wall after pregnancy is to perform special postpartum exercises that specifically develop this essential skill. Second, dynamic stability is the other key component of postpartum reconditioning and exercise after pregnancy. This term may sound like a contradiction. However, it refers to the ability to maintain proper position during exercise. Because you have both loose joints and weakened abs after pregnancy, it is particularly easy for the weight and force of your limbs to pull your pelvis, spine, or shoulder girdle out of good alignment. When your bones are out of proper positioning, muscle functioning is impaired, which greatly reduces the effectiveness of exercise. After pregnancy, you must learn to recognize and eliminate undesired movement during exercise. Dynamic stability is an essential skill that enables you to develop core strength, promotes healthy spinal function, and prevents injury. The patient usually does very well. In most cases, diastasis recti usually heals on its own. Diastasis recti usually persists long after the woman gives birth. Exercise may help improve the condition. Umbilical hernia may occur in some cases. If pain is present, surgery may be needed.